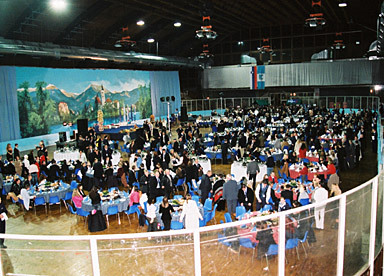 There has been a scenery change in Bled’s sports hall and ice rink in preparation for the gala evening and farewell ceremony for participants in the 17th Annual Conference in Bled. On the evening of Saturday October 16th guests were shown into premises which had been transformed into a dining room for 600-plus people. Tables had been arranged in style on a wooden floor which completely disguised the ice just beneath. And as befits such an occasion there was a beautifully laid-out buffet. View of the transformed sports hall! Who would have thought that the ice of the ice-rink is only five centimetres below the guests’ feet? To the sound of the famous song ‘We are the world…’ and to welcoming greetings, this gala evening got off to a good start with a dynamic and astonishing performance from the ‘Hip Hop Mammas’, followed by a performance from their daughters! As well as a remarkable barman with unbelievable skills! 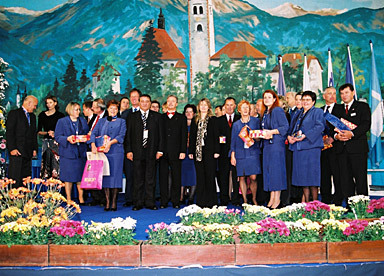 What a fine introduction for the guests who listened with pleasure as Alfonso Benvenuto welcomed them to the gala dinner, congratulating the organisers on fulfilling their promises, and on enabling everyone to meet, to share experiences, to form friendships – and expressing the hope that everyone would take with them from Bled the best of all memories of this event. Among the guests was a whole array of dignitaries, including Elido Bandjeli, secretary of state for education, together with his wife as well as the sponsors of the various competitions. Alfonso Benvenuto made a point of thanking from the bottom of his heart all the Bled teams for their commitment and their hard work, for the wonderful gala evening and their warm welcome. ‘Thank you to Janez Solar and Jana Spec and to all those who have worked so hard; thanks also to the mayor of Bled. My thanks go to the dignitaries and to the members of the special competitions commission. Don’t forget the excellent moments you have spent here, and don’t forget the pleasure of the students, whether or not you won a prize – each one of you holds our future in their hands. Many thanks also to our speakers and contributors: Georges Asseraf, Régine Davroux, Gilles Honegger, Jean-Michel Wautelet, Sibylle Schoch, Marco Otten, Christiane Keller, Jo Laengy. Thanks to the members of the Presidium and .. see you in Antalya! After a brief presentation of the CAT by the commission’s chairman Louis Robert, gifts were presented to all those who had made this superb Annual Conference possible: Janez SOLAR, the school director, Jana SPEC, vice-director, Peter MIHELCIC, bar & service competition, Marijan LEBAR, service competition, Nikica ZORC, cookery & pastry competition, Janez PRISTAVEC, cookery competition, Anton TUSEK, pastry competition, Jana VIDIC-STRNAD, tourism & reception competition, Emira MUHOVIC, tourism promotion competition, Tadeja KRASNA, reception competition, Silva GOMZI-PRAPROTNIK, promotional material, Peter MARKIC, additional events, Gordana VULIC, additional events, Milan KRISELJ, additional events, Rozica Slavica FERJANCIC, students’ placement, Tina HITI, transfer & excursions, Ciril URH, evening receptions, Veronika ZUPAN, administration, Milena PETEK, administration, Urska SCHIFFRER, administration (accountancy), Petra POLAJNAR, administration, Mojca JOST, general secretary. And of course the guests applauded loudly as the gifts were presented. presents for the linchpins of this Conference! 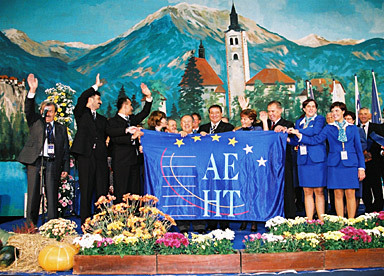 The last official act of the evening was the arrival of the AEHT flag which was solemnly handed over by the Bled team to the Turkish team, consisting of Kemal Topaloglu, Levent Tolay and Nadire Gunes who will organise the 18th Annual Conference next year in Antalya! Each year this is an important occasion, now greeted with loud applause. 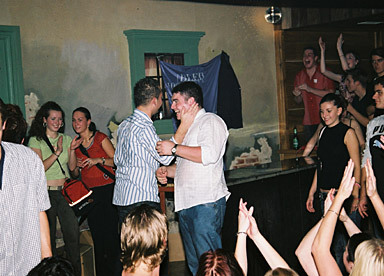 And just as in previous years, the moment came for the first departures, but also the moment for dancing to begin, now that the pressure was off. It was especially the students who took delight in creating a discotheque atmosphere, unleashing their energies in farandoles and ‘sirtakis’. Come on then. It’s time to leave. The bus transfers will be there early in the morning. But goodbye, see you next year in Antalya! 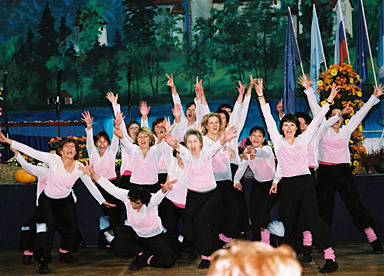 A finale in true AEHT tradition: full of joy and rhythms. Goodbye!